Vitrectomy is a surgical intervention undertaken by a specialist where the vitreous humor, a gel that fills the eye cavity, is removed to provide better access to the retina. This procedure allows for a variety of repairs, including the removal of scar tissue, laser repair of retinal detachments and treatment of macular holes. Eye Infection A disease called endophthalmitis can develop within the eye, after eye surgery or injury. 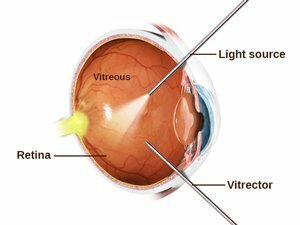 A vitrectomy is performed in serious cases followed by an injection of antibiotics. Trauma to the eye Trauma to the eye may cause vitreous haemorrhage or retinal detachment. A dislocated lens During cataract surgery, the natural lens of the eye falls into the vitreous cavity causing inflammation and high eye pressure. A vitrectomy can remove the dislocated lens. Macular hole A hole occurs in the middle of the retina, which causes loss of detailed vision. What are the Indications of Vitrectomy? A vitrectomy is performed using either a local or general anaesthetic. Three small incisions are made in the sclera, and surgical instruments are inserted into the eye. Vitreous cutters, forceps and scissors remove the vitreous gel and scar tissue that’s growing on the surface of the retina. A fibre optic illuminator is used to light the inside of the eye during the operation. The vitreous gel is replaced by saline solution, air, or gas. The vitreous does not come back, and the eye can function adequately without it. Often, silicone oil or heavy liquid is inserted into the vitreous cavity at the end of the procedure. Usually, a silicone band is encircled around the eyeball to assist with reattachment of the retina. Most patients go home after the surgery. Visual recovery after surgery varies from patient to patient, depending on the underlying condition for needing a vitrectomy and the type of substance inserted into the vitreous cavity at the end of the operation. Your doctor may give you some antibiotic drops to help prevent an infection in your eye. If your eye feels swollen, you can take prescription pain relievers for comfort. Your doctor may want to check your eye after the surgery.